Hop into the Wayback Machine and set the clock to Baroque-Retro-Pop where "Greensleaves" meets the funky late-60s/early-70s. 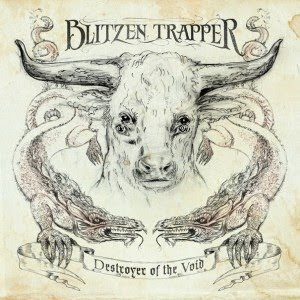 Blitzen Trappers' newest Destroyer Of The Void is loaded with poetic sentiment, wailing, low-key Big Star type guitar and harmonies, and several thumping bass lines that will likely lead to a new baby boom (I'm looking at you "Evening Star"). The band, as much as the album, is defined by the joyous and experimental (if within the boundaries of period work) song design of Eric Earley. Blitzen Trapper gives you a lot of high-drama, climbing the scales and descending them theatrically, but always well within sight of predecessors like Bob Dylan, Steve Miller, and The Beatles. Throughout Destroyer Of The Void, they hook you with a quality lick or bouncy piano riff, and the lushness of the sound is what makes it possible to listen again and again; keyboards and strings fill in the standard bass, guitar, drum setup. I guess, as I'm thinking of this now, one of the best contemporary comparisons I can make is to Edward Sharpe and the Magnetic Zeros. The vocals can be eerily similar, and the style is right there, but really where Edward Sharpe hit lulls in his album that weren't as enjoyable as the classic tracks, Blitzen Trapper avoids that entirely and provides a continuous chain of quality songs. "Over the western world/ shadows fall/ under the kind and dying trees we call/ together still, the feel, the breeze/ to shatter all these waking dreams we've told/ ourselves to keep us free and clean" to the lamentative "The Man Who Would Speak True": We lived together in an old hotel/ A broke down palace with a wishing well/ The neighbor girl taught me how to spell/ And how to steal what I could not sell/ But I fed my tongue on the Devil's rum/ In a roadhouse run by godless bum/ On a drunken night with a stolen gun/ I shot my lover as she made to run." It's lyrics like these that make Blitzen Trapper a powerful band, even if the sound is sometimes too familiar. I would defy you, or anyone to walk away unaffected by either of those two songs. It's just plainly beautiful music that raises emotion. It's not light, it's not bristly or angry. It's poetry with instruments attached. It's probably that demonstrated excellence that makes the few near-misses feel less fantastic. I have a hard time complaining about anything on Destroyer Of The Void, and even calling lesser tracks like "Dragon's Song" and "Lover Leave Me Drowning" bad is a grievous error because they aren't bad, just less memorable, less affecting. Any disappointment I have with this album is purely motivated by letdown from the bulk of exceptional work that can't completely offset the so-so stuff. Regardless, this is an incredible album and one that deserves to be heard far and wide. Now, a pair of additional comparisons: Fleet Foxes and Chutes Too Narrow "folksy" era The Shins.